Compact 2 bedroom duplex unit, easy walking distance to Batemans Bay CBD. 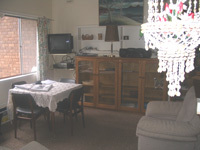 Ideal for a small family on a budget with easy access to beaches, parks, cycle way, shops, clubs and restaurants. 1 double bed and 2 single beds, small brick duplex house, carport with space for a boat, self contained kitchen, suitable for a couple or family of 2 adults & 2 children or 4 adults. Has fenced backyard for outdoor pets. Minimum $20 admin fee for all cancellations. 50% retained if cancelled within 48 hours; 100% retained if cancelled within 24 hours of stay.